This week’s dinner is a re-run. Between conferences, the 28 Day Challenge, and the Family Wisdom Conference, I haven’t had much time. So, off to Oleson’s I went. 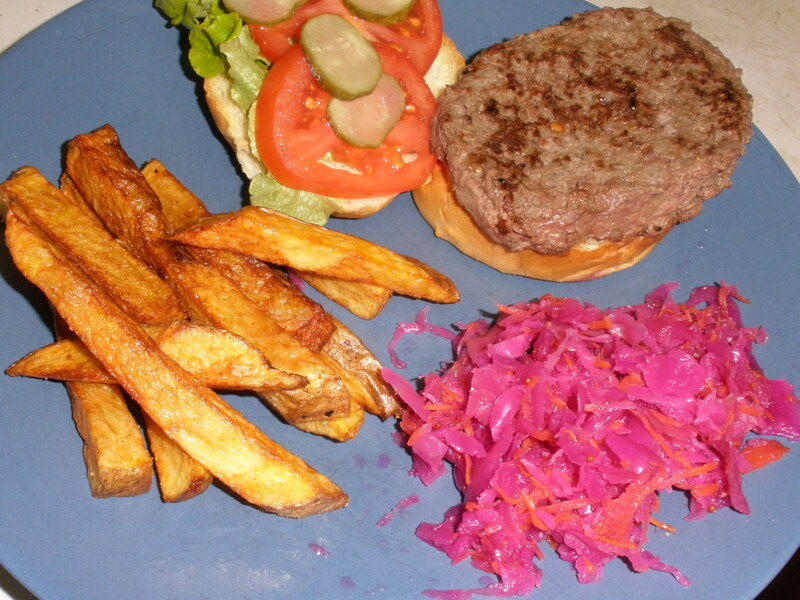 Buffalo burgers and local buns with homemade pickle chips, local lettuce from the Farmers’ Market and homemade fries from local russets. Not very exciting, but quick & easy and a big hit with the whole family. 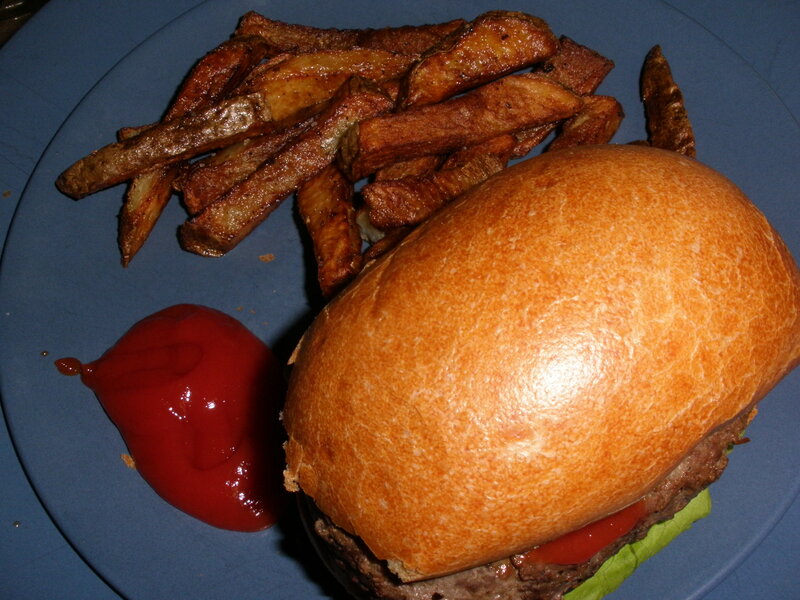 Wish I could take credit for the bun; they were yummy! This week I’m remarkably ahead of schedule!! I’ve already cooked my Dark Days Dinner and I’m writing the post before the weekend?? On top of that I attended (and spoke at) the school board meeting on Monday, created a canned citrus concoction for the January edition of the Can Jam, wrote the post that went with itand helped hubby and the kids finish all the laundry. On top of all that, I found the secret ingredient I needed to re-attempt the Can Jam! Good thing we live close to a buffalo farm. . .
Ok, so the house is still a mess and we’re now out of laundry detergent, but I can’t do everything. I was so busy this week getting ready for Christmas, that I nearly forgot about my dark dinner before we headed out of town. Fortunately for me, I had a buffalo roast in the freezer! We are so lucky to live near Oleson’s buffalo farm. You can drive by whenever you want and see the herd grazing, and you can pick up the meat at the grocery store. Buffalo is delicious; like beef only slightly more game-y. It’s also very healthy and super lean. 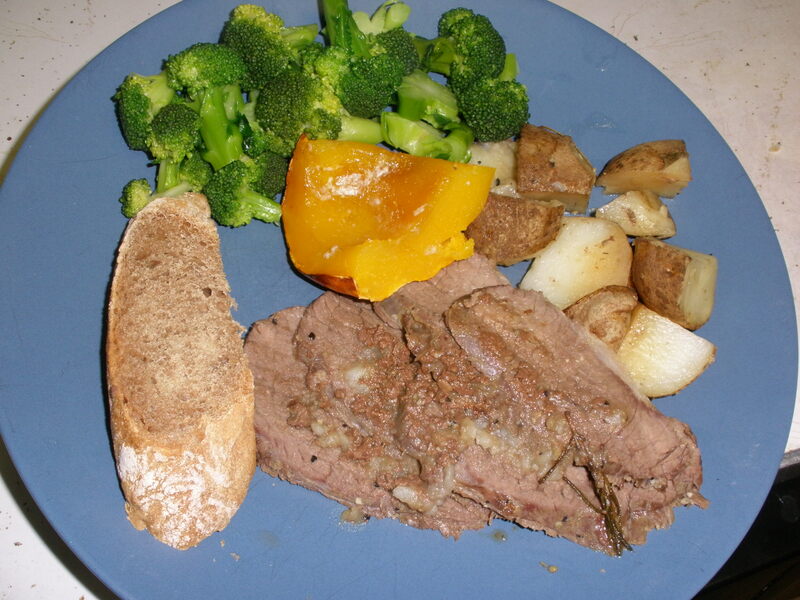 I pulled the roast to thaw, seasoned it and seared it in a pan with some olive oil, salt and pepper. Once the meat was nicely browned on both sides, I deglazed the pan with Bell’s Special Double Cream Stout; it made a nice, dark, rich base for my broth. After that I added some water, a whole onion and a crushed head of garlic from Providence Farms. 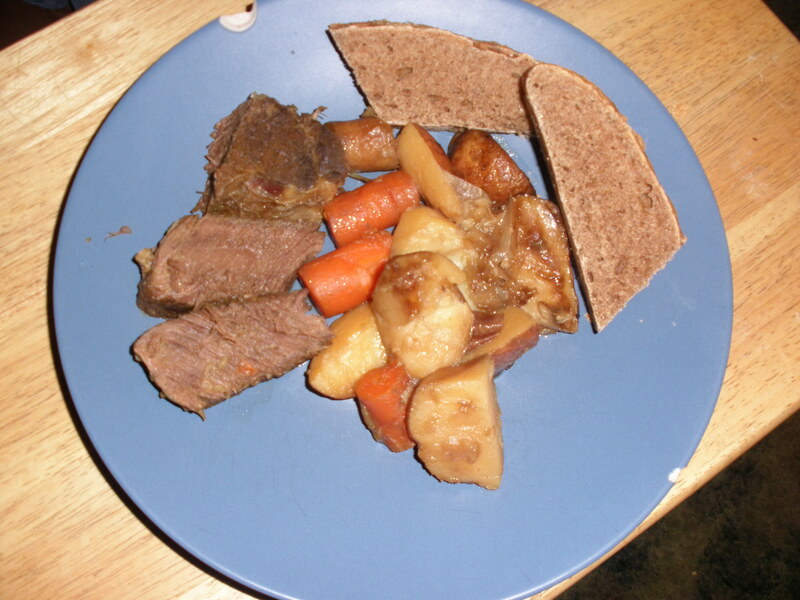 Next I chopped and added several carrots from a local farmer that I picked up at Oryana, five or six local redskin potatoes and a parsnip I had in storage. Once everything was in the pan, all I had to do was set the oven to 225 degrees and let it cook for a few hours. While the roast was cooking, I started a loaf of bread to rise and ran some last-minute errands. When I got home, I turned the oven up to 450, pulled the roast out and put it back on the stove on low heat while the loaf of bread that we ate with the roast baked. Even crazy days can be Dark Days! I can honestly say that the idea of fast food repulses me. Don’t get me wrong, I used to love Burger King as much as the next gal. I loved it even though I knew it wasn’t good for me; they don’t call it junk food for nothin’. But, somewhere along the way I realized that it wasn’t just bad for me, it’s bad for us. When I say us I mean that collective “humankind” that we all belong to. It’s bad for the earth. It’s bad for our economy. It’s bad for our healthcare industry. I won’t go into industrial food and factory farms because I’d probably be preaching to the choir, but if you’re not familiar with agribusiness and the related issues, I highly recommend Michael Pollan’s Omnivore’s Dilemma: a Natural History of Four Meals. I stumbled upon it in Horizon books one day last spring and decided to make it my summer reading. I’ve been a slow foodie in the making for a while, but this book was the proverbial “straw that broke the camel’s back”; I haven’t eaten fast food since I finished it. When you’ve sworn off fast food, what do you do when your son asks for, “A burger like Burger King without any corn in it” for dinner? You cook. Oleson’s Buffalo Farm is just down the road from us and the meat is sold in their grocery stores. The burger is leaner and tastier than any ground beef I’ve ever had, and is reasonably priced if you don’t plan on eating it every day. Plus, if you drive by the farm, you can see the buffaloes wandering around the field eating grass like they are supposed to. 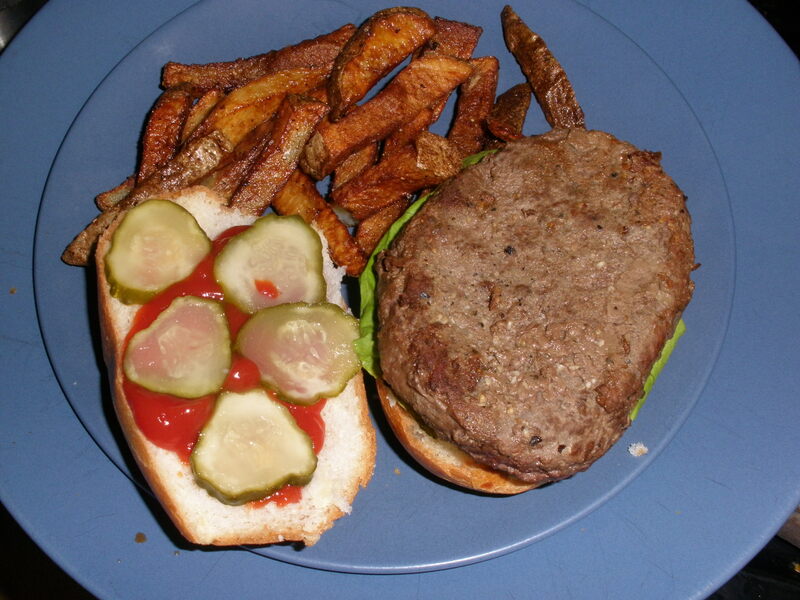 Oleson’s sells ground buffalo already made into patties; they’re uniformly shaped and really flat, just like fast-food patties are, so Tuesday night I thawed a pack and started dinner. My dinner wasn’t as fast as the drive-through would have been, but it was cheaper, way more delicious, much better for us and didn’t come with a side of diesel fuel like a fast-food dinner does. This week was a busy, crazy week. Thanksgiving was a wonderful day spent with my hubby, my kids and my inlaws. I took some local freezer slaw that I put up months ago and homemade cranberry sauce that I canned last weekend along with a pumpkin cheesecake. I plan to do my own “Dark Days” Thanksgiving but I didn’t pick my turkey up until this morning and I don’t have the time to deal with him, so that will have to wait a week or two. Instead, I needed a way to utilize my exciting new local ingredient! Thanksgiving morning my friend, Michelle, deliverd a 50lb. bag of freshly-milled, organic spelt flour from Organic Bean and Grain in Caro, Michigan. I’ve been looking forward to using it ever since I learned about it and I had just the recipe in mind. When I was a kid, my mom used to make pasties. Much to my mother’s chagrin I ate them doused in ketchup. As an adult I fell in love with pasties all over again when I started making them myself. My husband, once a chef at both The Grand Traverse Resort and Spa and North Peak Brewing Company, and I started making our own pasties years ago. 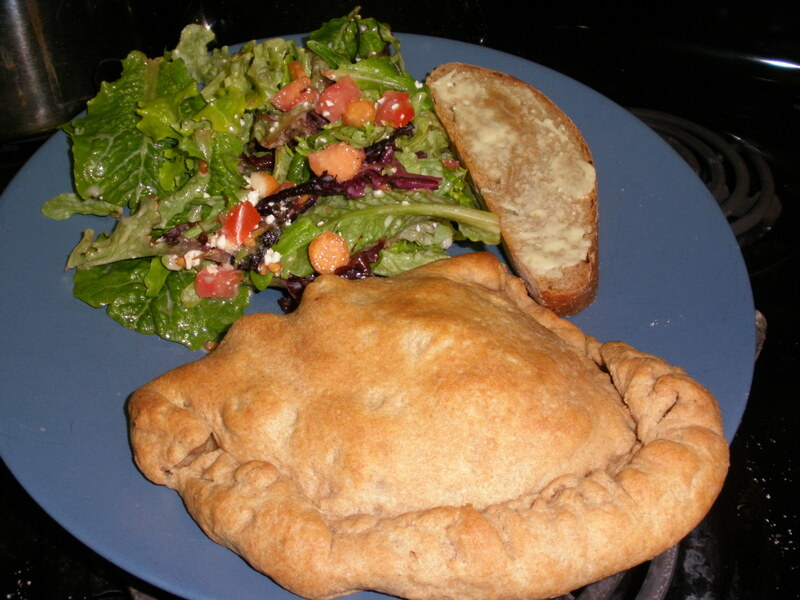 While most pasties are simple meat and vegetable pies, Hubby and I experimented with pasty recipes for a long time until we found the perfect recipe. Pasty purists might disagree, but they’ve never tried mine! Cut butter into chunks and stir into the flour until coated and separated; chill. Combine 1 1/2 cups flour and yeast. Heat buttermilk, sugar and salt until warm (120-130°) and add to flour/yeast mixture along with the egg. Beat on low with an electric mixer 30 seconds and then on high for 3 minutes. Stir butter/flour mixture in with a spoon. Sprinkle a board with a quarter cup of flour. Turn dough out onto the floured board and knead gently about eight times. 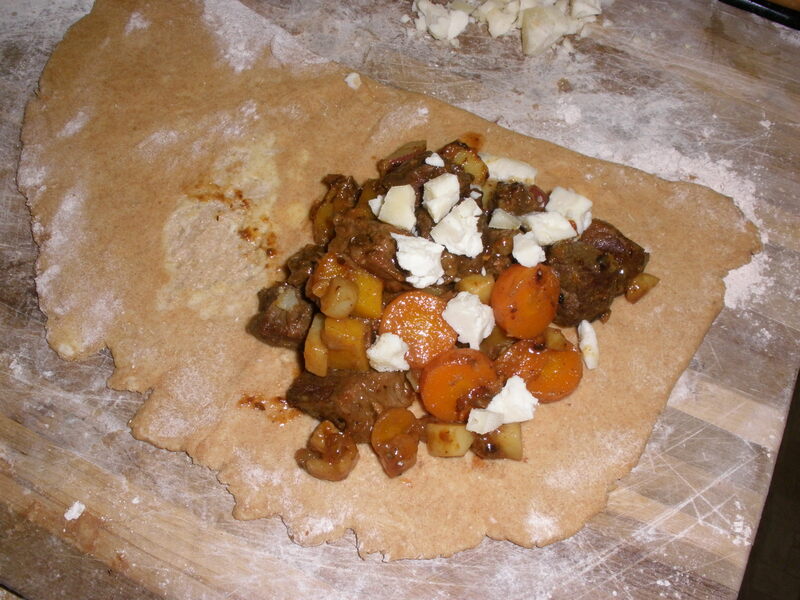 Roll dough into a rectangle and fold into thirds, loosely wrap and put in freezer for 20 minutes. Roll dough again, fold into thirds, turn 90° and roll again. fold and roll two more times, wrap dough and refrigerate for four hours. Remove dough from refrigerator and cut into quarters. Return three quarters to the fridge. Roll the remaining quarter until it is about 1/4″ thick. Cut the rolled piece in half. These pieces will be used to make two pasties. The process will be repeated with the other quarters as necessary. You will probably have one or two quarters left over to freeze for later. Drizzle a little olive oil into a preheated skillet. Add onion and stir to carmelize. Season buffalo with salt and pepper then dust with flour. Add buffalo to skillet and saute ’til brown. Cover with water and simmer until the meat is tender. 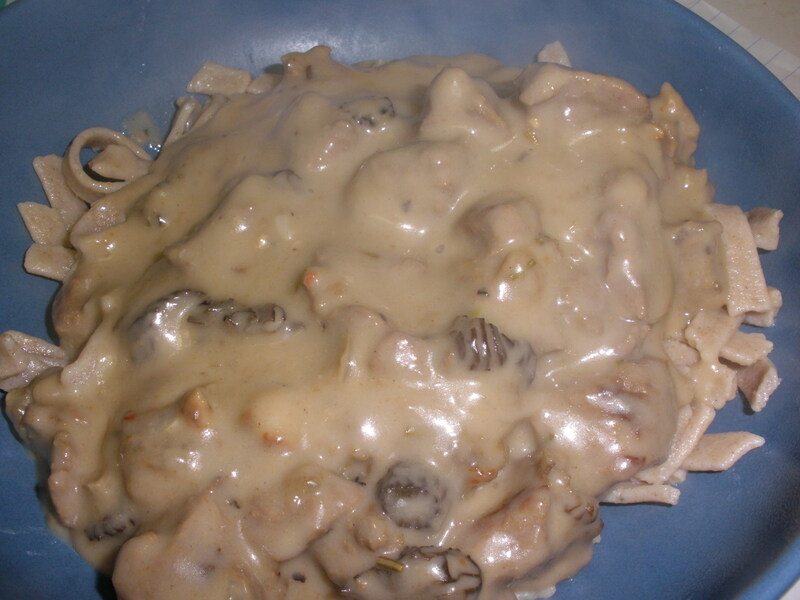 Add vegetables and cook until the vegetables are al dente and most of the sauce has simmered away. Spoon filling onto one half of dough semicircle. Sprinkle shaved cheese onto filling and fold pastry in half. Fold, pinch and crimp edges of pastry to seal filling inside. Bake in a 375° oven. Check after 15 minutes; you may need to cook them one or two extra minutes. I served the pasties with a salad of mixed greens and carrots from Providence Farm, diced tomato and my old stand-by dressing: yogurt, minced garlic, homemade feta and cracked pepper. Even though we didn’t really need bread with our pasties, I couldn’t help myself and tried out my new flour on homemade spelt bread. Dinner was pretty labor intensive, but it was so good that it was worth every minute of prep time I put into it. Plus, I have leftover croissant dough stored in the freezer now to use another day.